Why was this chapter in the “Ramayanam” named Sundara Kanda while the rest of the chapters like Bala Kanda, Ayodhya Kanda,Aranya Kanda,Kishkindha Kanda, Yuddha Kanda and Uttara Kanda were self explanatory. Very nice explanation. Thank you, here is my insight. The vision was a women wearing soiled clothes surrounded by many demons in various scary forms.She seems to be keeping her mind out of worldly things and in deep sorrow since her savior and her beloved is not close by. Exhaling in despair this was what Hanuma saw over and over again in excitement and belief that his search for Mata Sita is over and he could find her just the way he had imagined. Ramasya Yatha RoopamSamseyam ati chekshana!! This is when Hanuma gets the Atma Darsanam and attains Siddhi since he could see Rama in Sita. 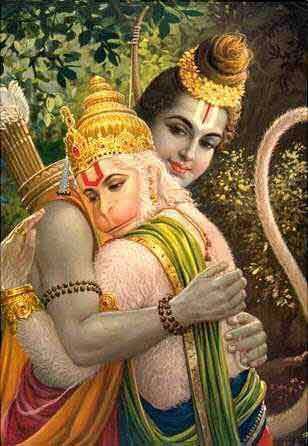 Hanuma thinks that Sita looks just like Rama with the same physical features.This is a strange comparison, but finding Rama in Sita who is a form of Prakruti this is the attainment of Advaita Siddhi and hence reaching the Yogi status. Since everything is Sundaram from Rama , his story, Sita , the Asoka Vanam,the Vanara, the chant of Rama and everything that is surrounding ,since all this is beatutiful this Kanda was named Sundara Kanda.Also called as Siddhi Sarga since he who has had the Atma Darshanam is the “Sundarudu” and the yogi who has attained Advaita Siddhi. this part of the ramayanam is called sundarakanda because, in this book the beautiful lanka is described in detail. also anjaneya swami is successful in burining most of lanka in doing so he found out basic layout of the city and its stongholds. thus he laid basis for a beutiful end to the war that is going to take place. also he found sita in good health which gave solace to srirama who has no idea whether his wife is alive or not .so it is called sundarakanda.